Set to premier at Cinecitt‚Äö√†√∂‚Äö√Ñ‚Ä† (of course in studio n¬¨¬®‚Äö√†√ª5) and on Chanel‘s website on December 1st, the long awaited ‘Once and Forever’ Chanel film features charming Kristen Stewart as Gabrielle Chanel and the house’s creative mind Karl Lagerfeld as the director. The film, which is Lagerfeld’s 20th short movie for Chanel since 2008, also casts Geraldine Chaplin as the older Coco Chanel and Jérémie Elka‚Äö√†√∂‚àö√≤m as a young French director. It will be unveiled alongside the Paris-Rome 2015/16 Métiers D’Art collection advertising campaign, which also features Kristen Stewart. The 25-year-old actress will thus be playing the role of Coco Chanel ” the iconic founder of what is regarded to be as one of the most innovative fashion houses in the history of fashion ” in a memorable 11-minute fictional biopic. 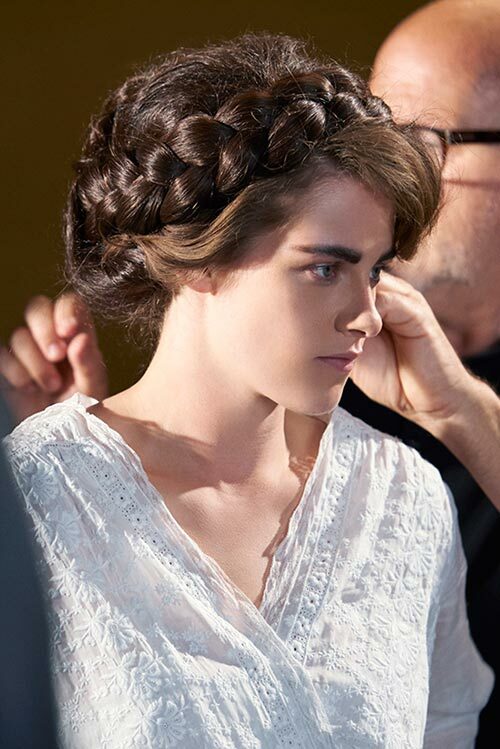 Although there’s a lot of secretiveness behind the film, WWD has recently reported that in the opening scene we will be admiring a sophisticated Kristen Stewart all dressed up in a ruffle-neck blouse and a woolen suit, portraying “a fiery young actress’ Coco Chanel at the time when she was working hard trying to hit the big time as a stage performer. Overall, we could say the short movie features a never seen before Coco Chanel. Aware of the fact that we are more used to her iconic final image, Lagerfeld wanted us to see a more vivacious and at time also flirtier version of the renowned fashion designer who, way before founding Chanel, still lived her life to the fullest. “I designed the set, the choice of the clothes, everything. I like improvisation, but I like only very professional improvisation. I hate when they go on for hours. I think it should be short and sharp. That’s the idea of the movie,’ later Lagerfeld explained.